St Kitts and Nevis Prime Minister, Dr the Honourable Timothy Harris, is in Dubai to discuss the new investment opportunities available for Middle Eastern investors looking to gain second citizenship. The St Kitts and Nevis Citizenship by Investment Programme , which enables applicants to gain second citizenship of the twin-island nation by investing in the country's booming economy, is the world's oldest offering of economic citizenship. On 29 March 2018, Prime Minister Harris announced a new mode of investment for the Citizenship Programme - the Sustainable Growth Fund - offering investors a stable and secure method to achieve a second nationality, while ensuring the nation to continues its strong development. The Prime Minister is expected to meet with a number of key stakeholders on his visit to introduce the Sustainable Growth Fund, as well as provide further information on the recent changes made to the real estate investment option for the Citizenship by Investment Programme. The Prime Minister will be joined on his trip by CEO of the St Kitts and Nevis Citizenship by Investment Unit, Mr Les Khan. A breakfast briefing for agents, to be hosted by global investor immigration advisory CS Global Partners, will be an included part of the itinerary. The St Kitts and Nevis Citizenship by Investment Programme has long been regarded as the Platinum Standard of the industry, known for its discrete approach, streamlined processing, and strict due diligence procedures. 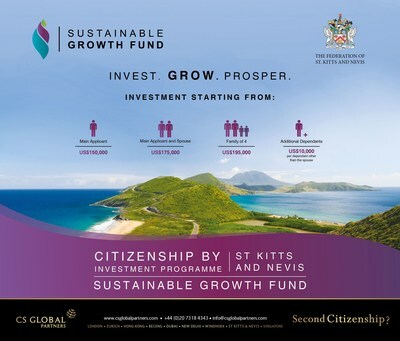 Those applying for second citizenship through the St Kitts and Nevis Citizenship by Investment Programme, can invest in the Sustainable Growth Fund for US$150,000 for a main or single applicant, or US$195,000 for a family of four. Each additional dependent will incur a US$10,000 fee - a welcome adjustment for larger families. "The St Kitts and Nevis Citizenship by Investment Programme has always been a popular option for those seeking second citizenship, and the Sustainable Growth Fund is yet another enticing investment opportunity for the discerning applicant. The Sustainable Growth Fund will be particularly attractive to larger families, who often have additional dependants, both children and grandchildren, to add to their application."